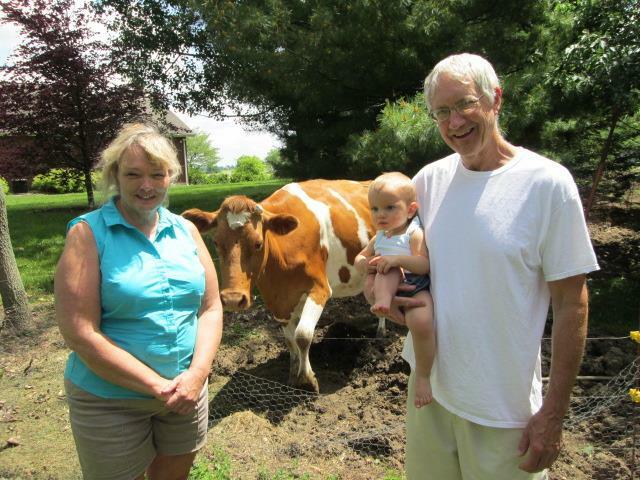 We spent some time with friends on Saturday then we visited my parents Sunday and Summer got to see the animals. The cow blew air onto Summer and she FLIPPED out! 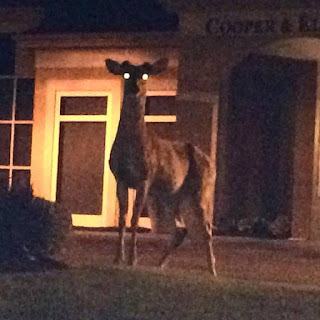 She was fine, but startled at first. The weather looks GREAT today to be in/on the water! 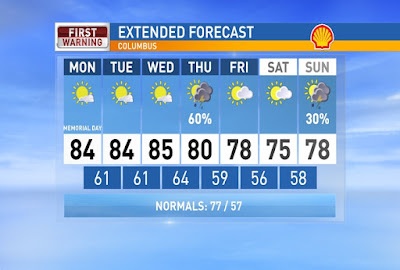 A drier, less humid pattern for the next few days thanks to a cold front moving through this morning. The cold front may trigger a very isolated shower or two, but most of Central Ohio will be staying dry today. Chance of rain less than 10%. Mostly sunny for your Memorial Day today with temps in the mid 80s and a little humid. Humidity drops more Tuesday with similar temps. Wednesday will continue the warm pattern then a cold front on Thursday will bring back more rain and cooler temperatures. High temps in the 70s return for next weekend. Have a good one! Summer had her first visit to the eye doctor yesterday! 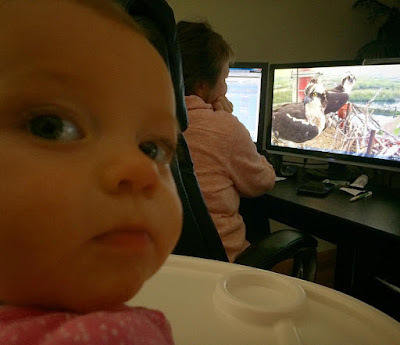 Her eyes had no issue, but our eye doctor does a free program for babies before 12 months and we figured we would just take her to get checked out and the doctor said her eyes were awesome! 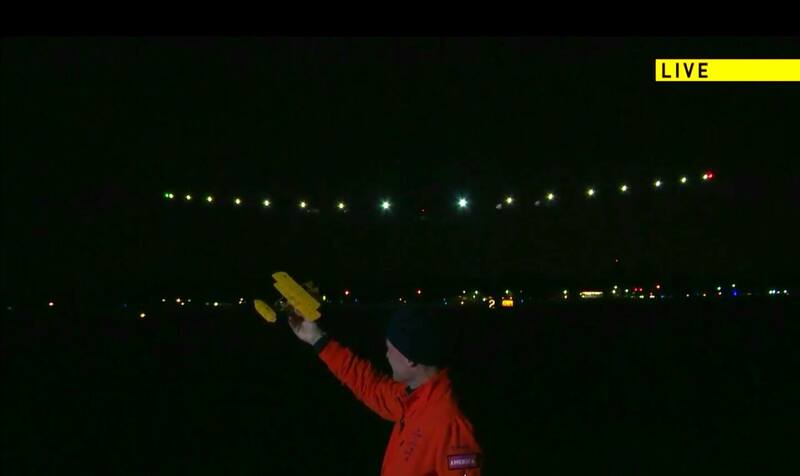 This morning was a fun morning, the Solar Impulse took off from Dayton International Airport at 4AM and was expected over to fly over Columbus. It is a solar powered glider plane that is flying around the world only on the sun's energy. 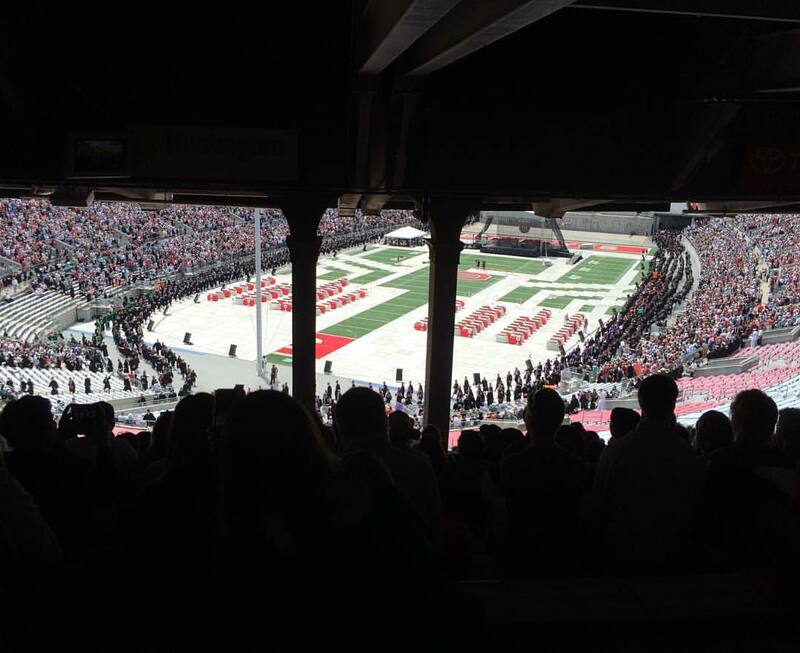 That is pretty sweet and it was a chance for us to see a world record being set. The two pilots have already set other records like longest solo flight, which was 4+ days over the Pacific, but we had a chance to see it over Ohio. 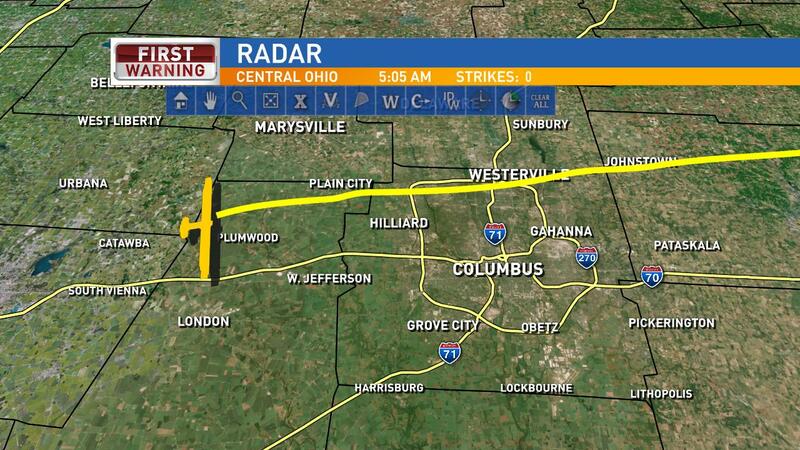 So here was the pre-flight path expected for it to take. Here is a more zoomed in version as it approached Columbus. Sure enough... we were able to catch it LIVE on TV. I get particularly geeked over the science behind all of it. 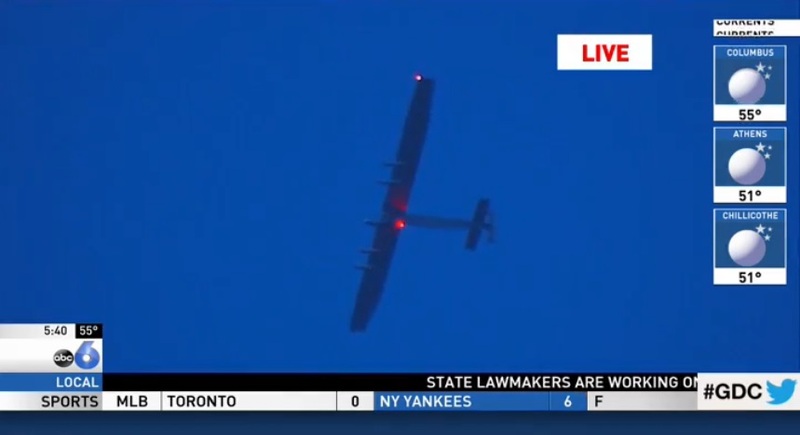 Here is the LIVE feed as it was flying over New Albany, Ohio. 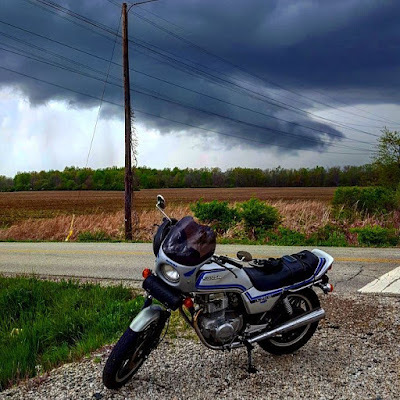 It did have a two hour holding pattern over Licking County as it was gaining energy to climb from 7,500ft to 15,000 ft to start going over the mountains. It is not about ready to move into Pennsylvania. The warm temperatures along with humidity are back! Humidity will start climbing today and stay high through the Memorial Day weekend along with temps in the 80s. 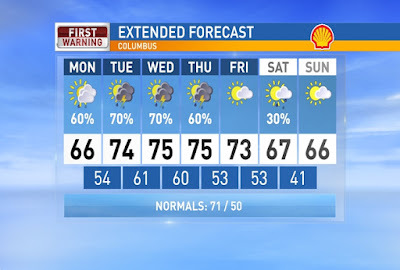 Isolated showers and storms will be possible for the entire extended forecast. The best chance to see the rain will be in the afternoon and evening, but cannot be ruled out at night or in the morning. No major change to this pattern in the near future. Have a good one! Friday was a good day. I have a LOT of filters on my work email to sort through all the thousands of emails. I kept letting the emails filter in and waited until I reached the 10,000 mark to hit "Mark as Read." That was good feeling! Another good feeling... getting a deal. A good friend works at the DeWALT corporate office and I was granted access for the friends and family liquidation sale. 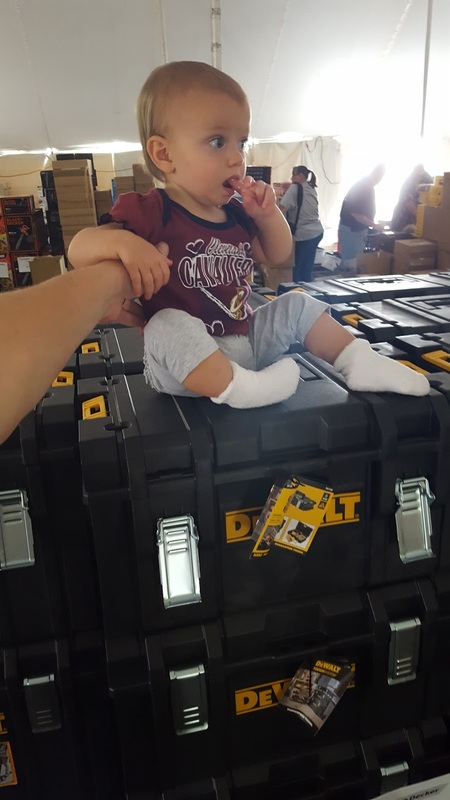 I had to use Summer as a size comparison for a tool box. She had a lot of fun looking at all of the good deals. 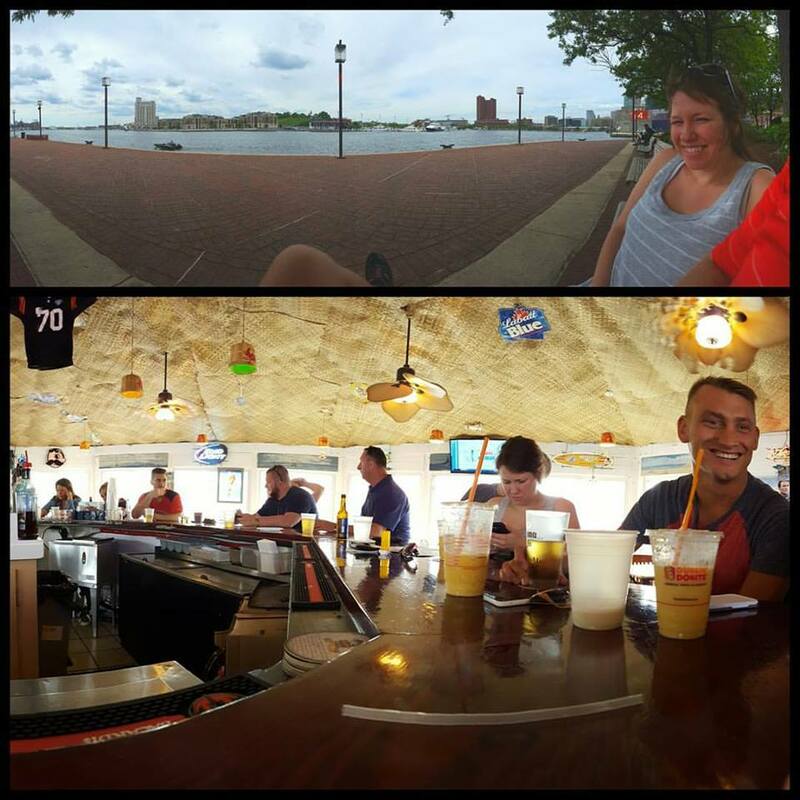 Saturday was a good day. 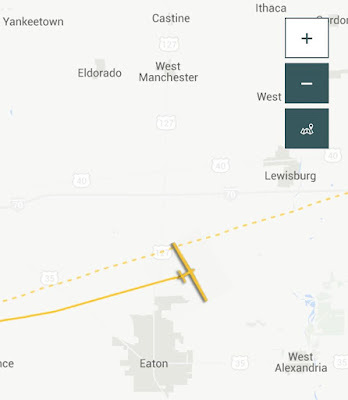 I was in Cleveland for a planned event, but I was tracking the Solar Impulse fly very near my family's farm in Western Ohio. 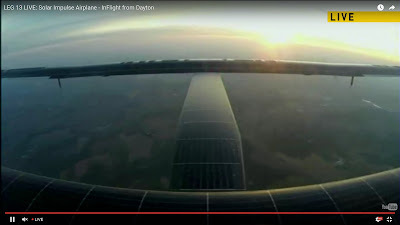 I was TOTALLY geeking out by the fact that the solar plane making it's trip around the world and stopping in Dayton, Ohio. 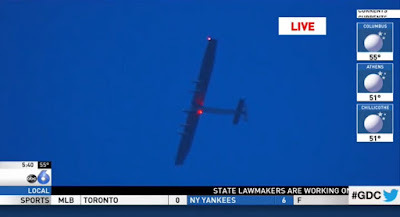 Here is a screen grab of the plane landing while the other pilot was on the ground holding up the Wright Flyer. The Solar Impulse can be viewed above that. 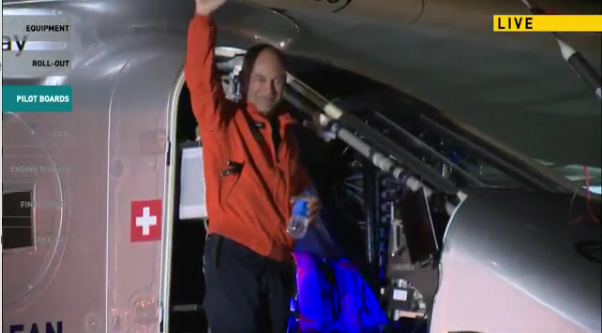 They are planning on leaving early Tuesday morning and Columbus will be right in the flight path, so I hope to track it with our tower cam tomorrow morning! Be sure to tune in! 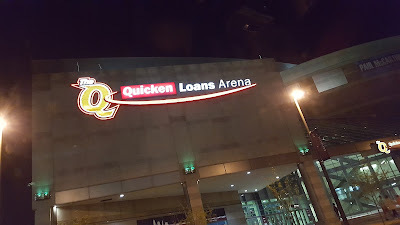 As mentioned, I was in Cleveland and right near The Q. The game was not played there, but I wouldn't be too excited to see them lose anyway. I hope Cleveland can finish this series in two more games so they can rest up for the finals. 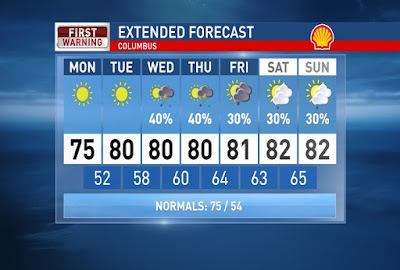 Starting to feel like summer with sunshine and warmer temperatures sticking around! 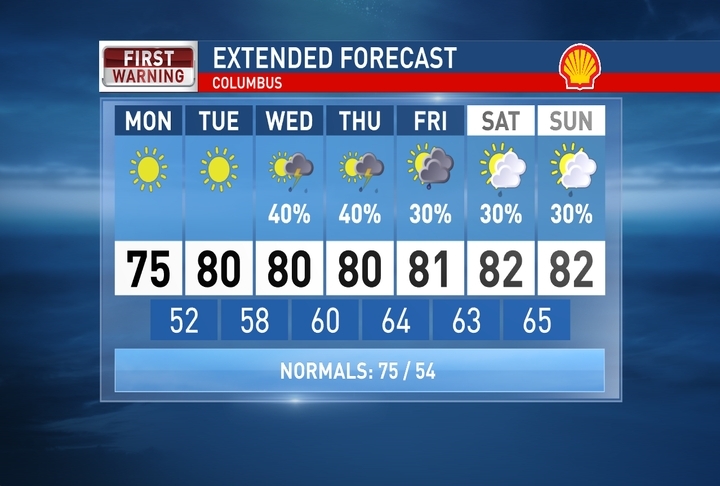 Lots of sun Monday and Tuesday as we warm into the mid 70s Monday then 80s the rest of the extended forecast. As our temperatures warm and humidity returns we will see the chance for pop-up afternoon showers and storms starting Wednesday. 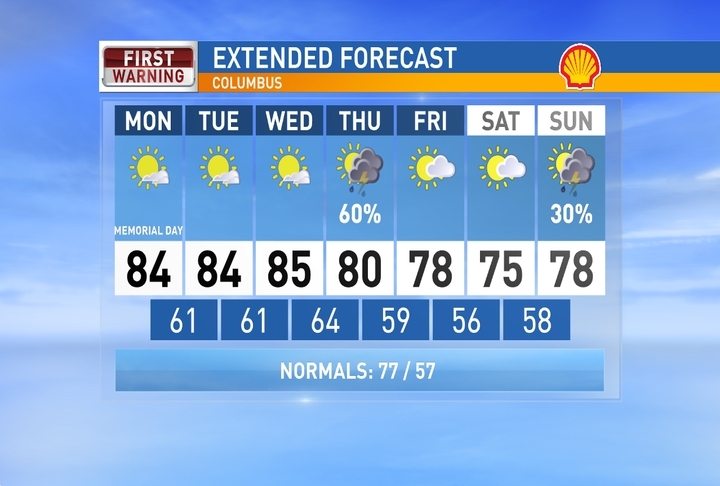 We keep the chance for pop-up showers/storms, warm temperatures, & humidity into the Memorial Day weekend. Have a good one! 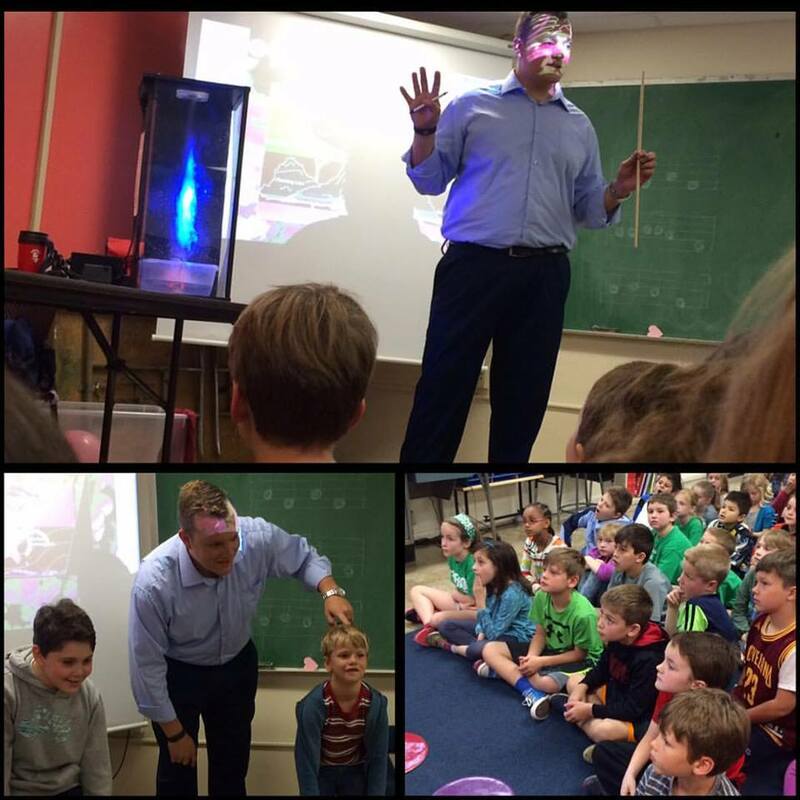 I had a school talk yesterday at Phoenix Middle School for the seventh graders' Tornado Tuesday. The kids had some GREAT questions. Great group of kids! I love when I get to come in while they are doing a weather unit because some of their questions have been brewing for days or weeks. We could see a spotty afternoon shower, as shown on this WRF model, but most of us will be dry from mid-morning and on. Early morning steady rain moving out of Central Ohio by mid morning. 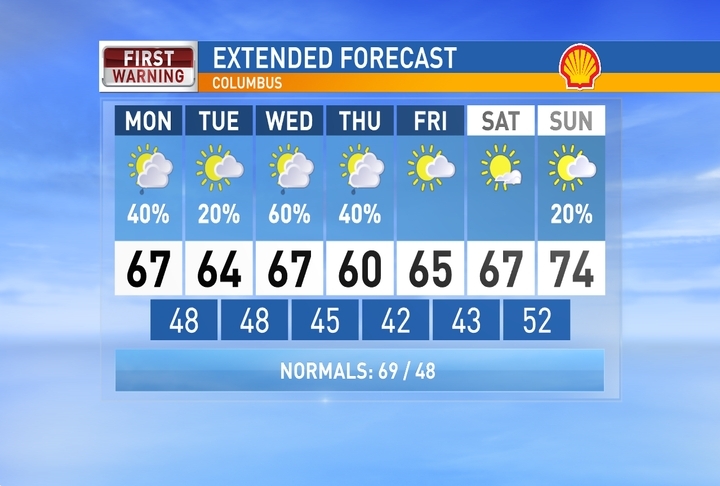 Mostly cloudy for the rest of Monday with an isolated afternoon rain shower possible. Clearing skies tonight and cool. 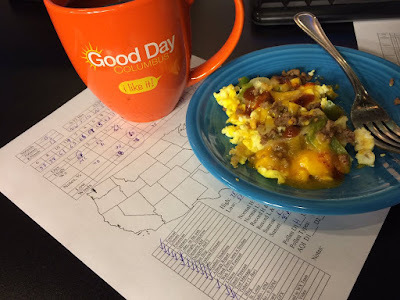 Mostly sunny Thursday and warming up. Warm with a few more clouds Friday with rain arriving Friday evening and heavy at times Friday night into early Saturday morning. Mostly cloudy Saturday, mild, then partly cloudy and dry Sunday. Have a good one! 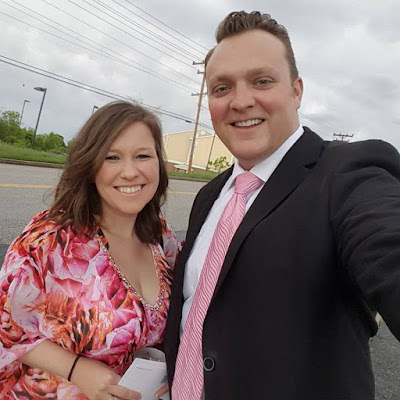 My date was electrifying for my cousin's wedding Saturday in Maryland. Summer spent the weekend with grandma and grandpa, so Dawn and I went to Baltimore Friday evening and we had a lot of fun. 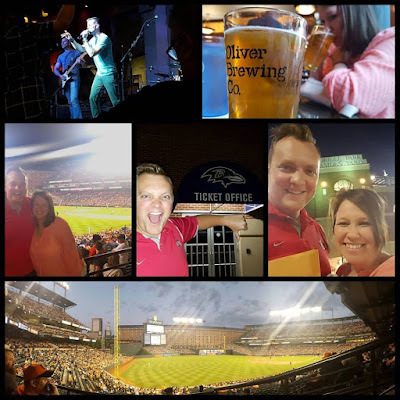 We went around town and spent time at the Orioles game, the casino, and we also had a little fun at the Raven's ticket office. 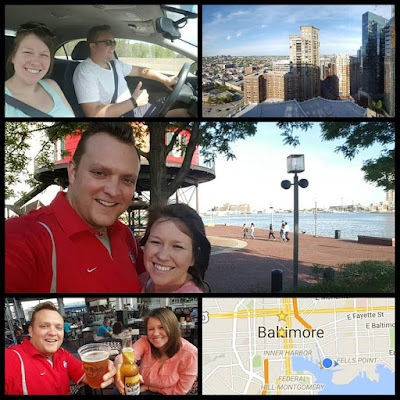 Saturday we spent the early morning on the Baltimore Inner Harbor then took the 30 minute drive north. My uncle and aunt own a crab shack restaurant and Dawn and I wanted to check it out. We thought about calling other family to let them know we were going to stop by when we pulled in the parking lot... then we noticed a few cars we knew. We go inside and most of the family were already there. Good times. 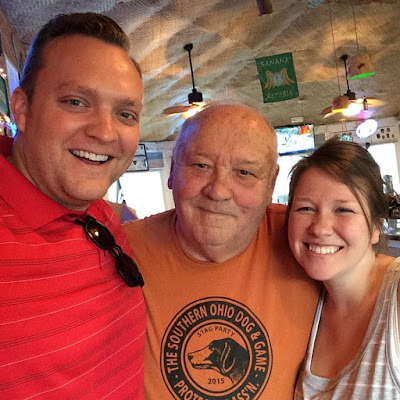 We also got to hang out with my grandpa and I cherish all the moments hanging out with him. He is a hoot. On to the wedding. Tiffany and Jon looked amazing and we had a lot of fun. 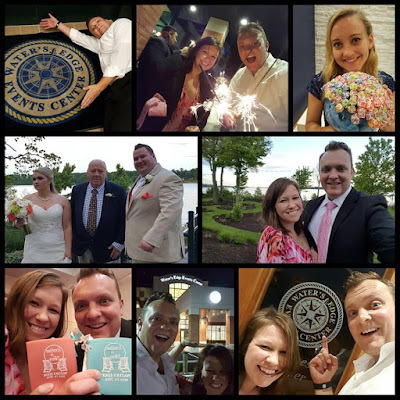 There is an inside joke with a few friends and "water's edge" and the wedding/reception was at the Water's Edge events center. So we took a LOT of photos. Lots of fun! 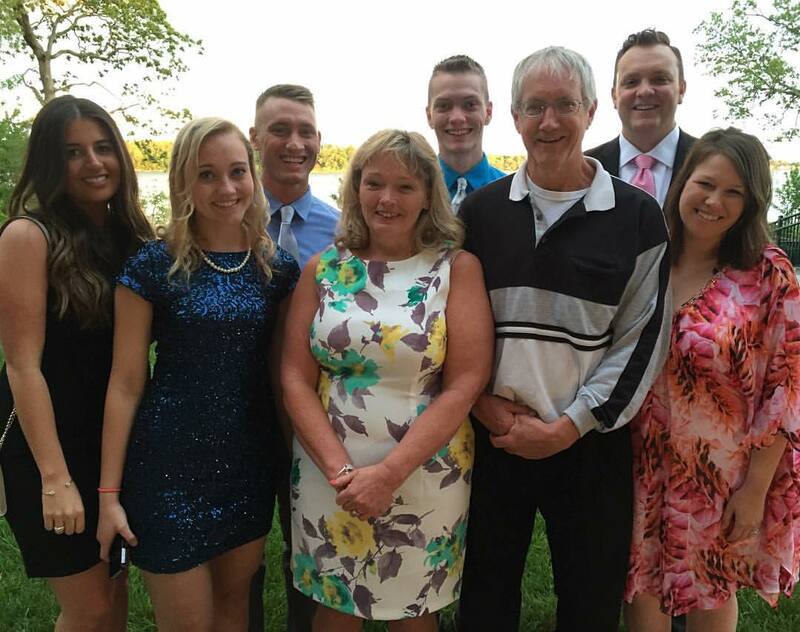 Here is all of our immediate family that made the trip. Clark brought a date and we tried to go easy on her. Good times, good times. So we drove through some snow on the way home. 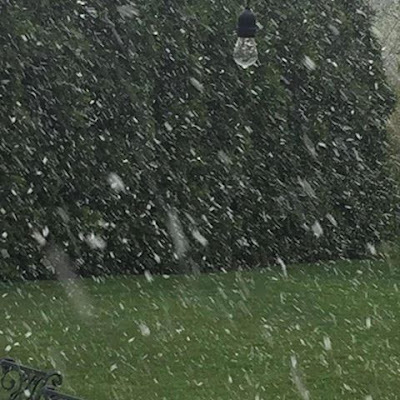 MAY 15TH SNOW!!! Insane! 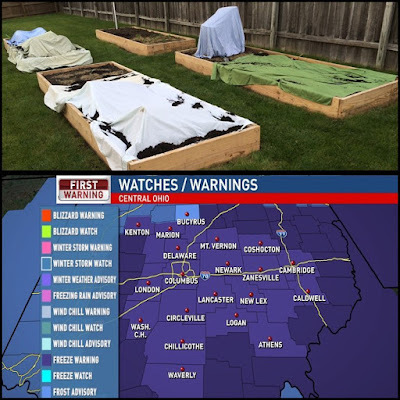 We have a Freeze Warning until 10AM today so I had to dig out a lot of old sheets for the garden and flowers. The next door rabbits appear to have enjoyed some weekend eats. UGH! A chilly start to your mid-May Monday morning with frost and temps in the mid 30s. Sunshine to start your day with more clouds in the afternoon as we warm back into the mid 60s. Scattered showers and mild for Tuesday then we dry out for the rest of the workweek and warm back into the 70s. 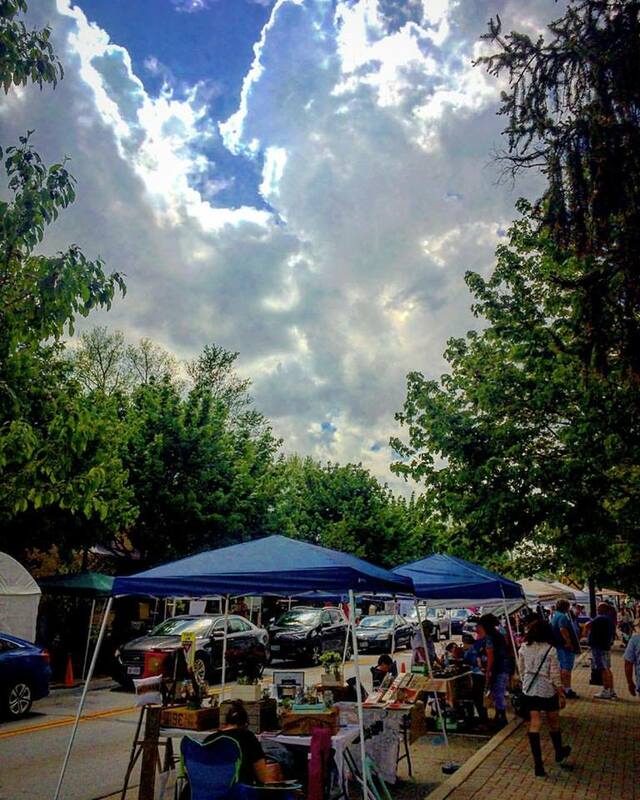 Another round of rain possible Saturday, stay tuned. Have a good one! 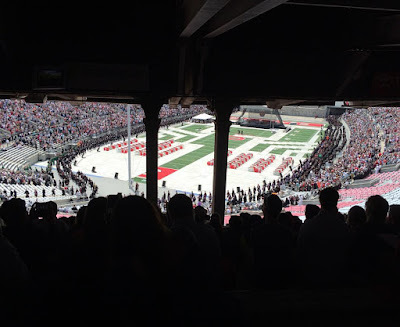 Because Sunday we were at Ohio State for graduation. 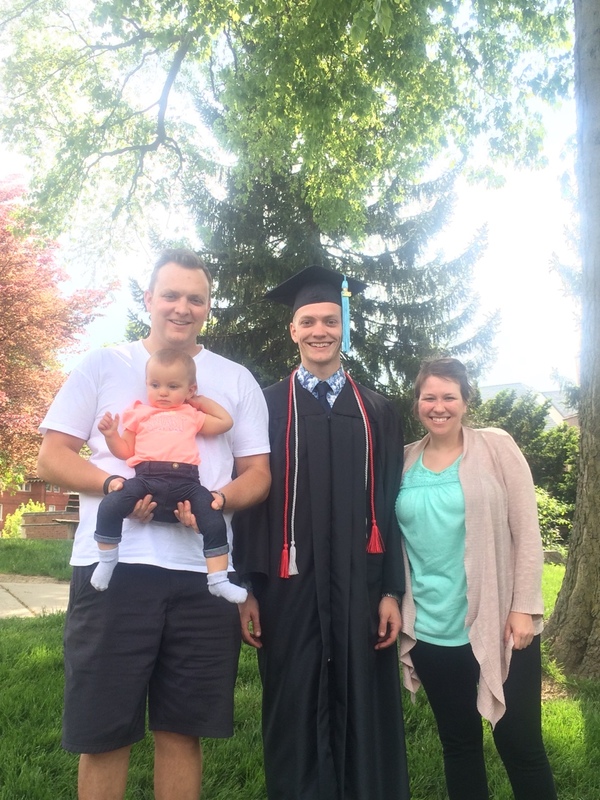 Marcus graduated and will be heading to Bulgaria in a couple months to each English with the Fulbright program. 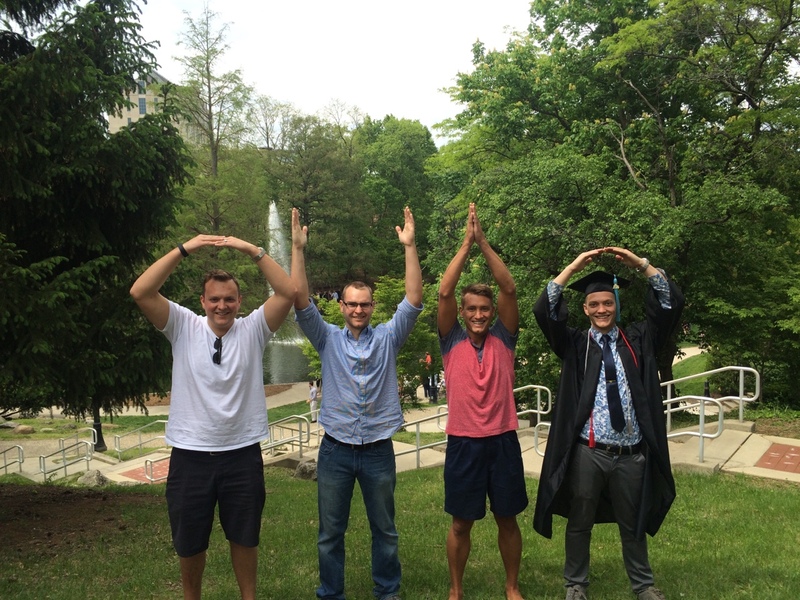 Which brings the total of Ohio State grads in the family to four. Just enough to do the famous O-H---I-O. 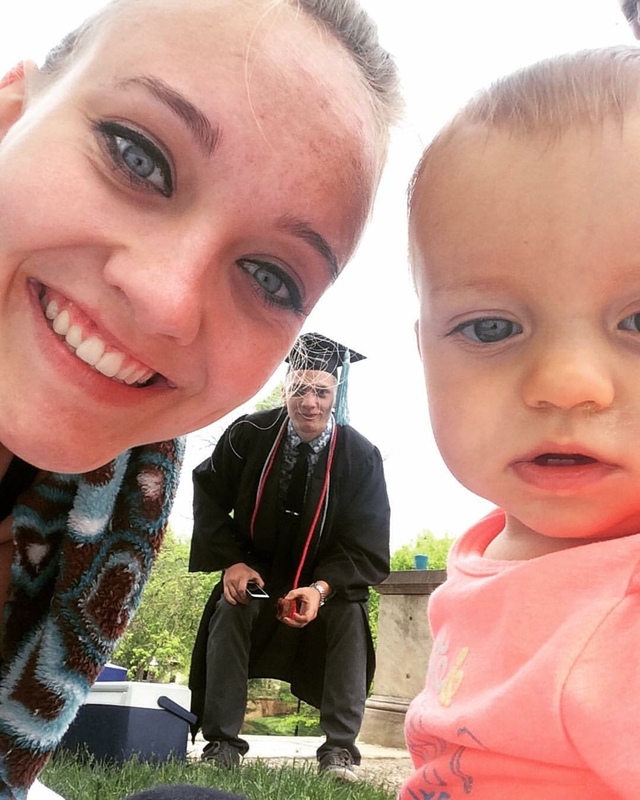 Amanda still has a while before graduating Kent State. Summer is still undecided. An unsettled week ahead with scattered showers and storms possible most of the week. 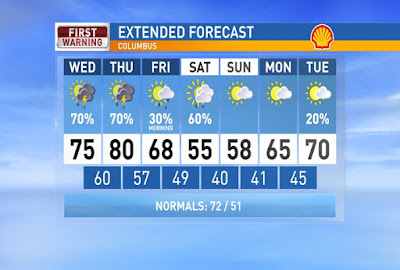 Highs will start off mild in the mid 60s then warm into the mid 70s for the rest of the workweek. A little rain possible early Saturday then cooling off into the mid 60s for the rest of the weekend and drying out. Have a good one! The entire weather team was together yesterday while we were prepping for the Safe From The Storm that airs on Saturday at 5:30PM on ABC6. Be sure to catch it, or at least DVR it! 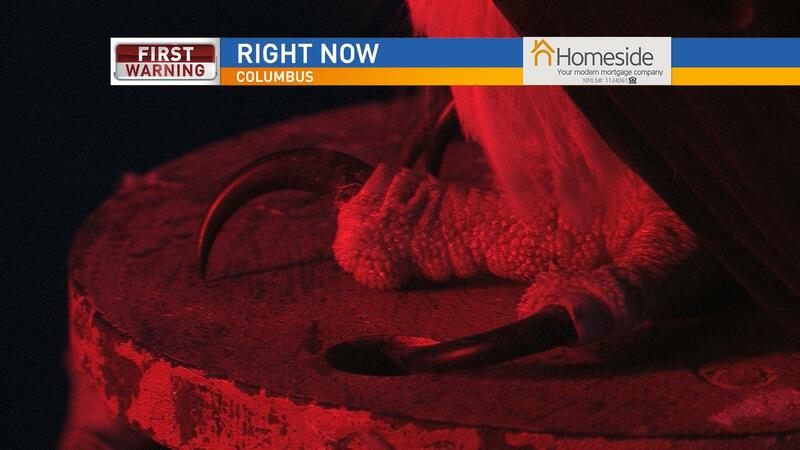 Check out the osprey talons! Those things are HUGE! It's fun watching the osprey on our tower cam as they continue building their nest. Cool today with scattered showers. 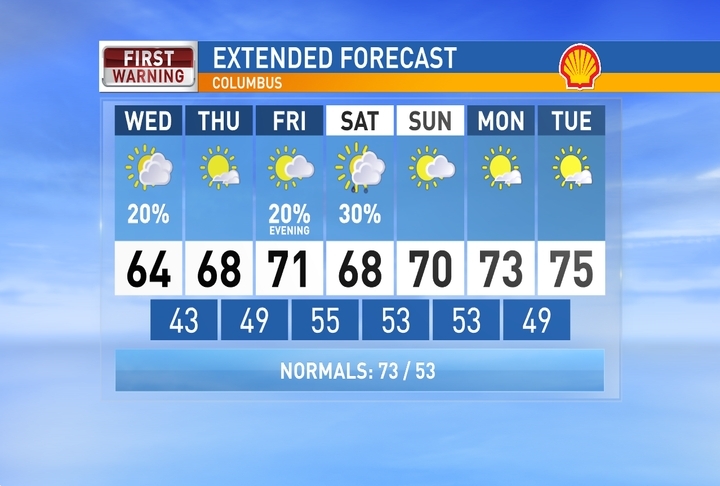 We start a warming trend with dry weather Friday then 70s for highs return for the weekend. 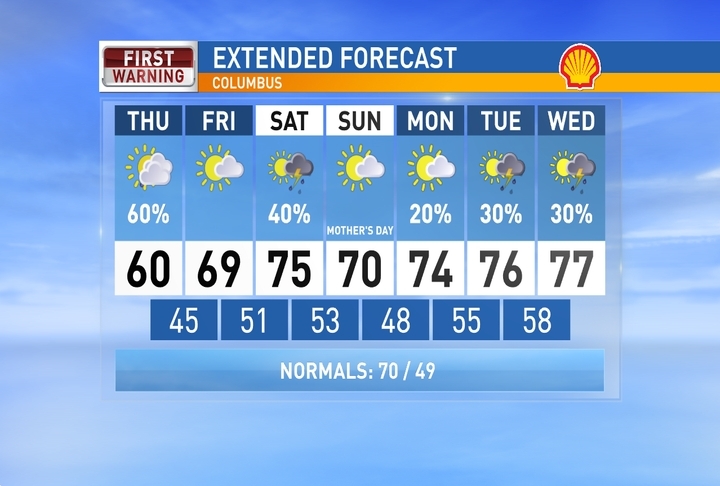 Scattered showers/storms likely Saturday then drying out by Sunday. 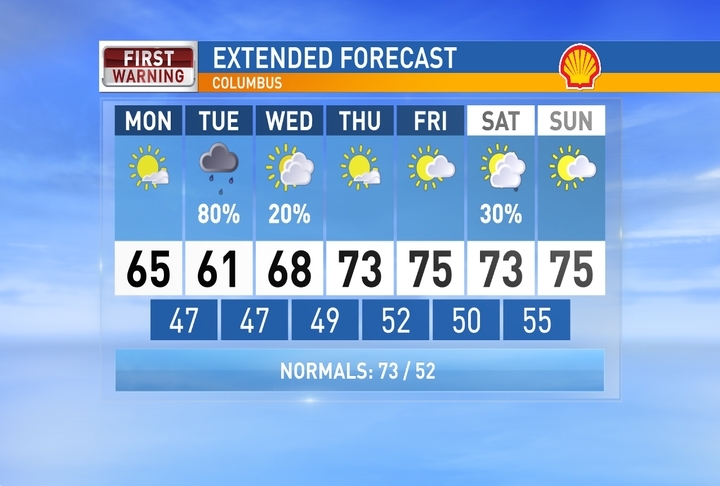 Staying warm next week with unsettled weather and scattered rain returning. Have a good one! I come inside from mowing the grass yesterday and I find Dawn and Summer watching our LIVE osprey cam on the station's website. Also, if you are watching, you can tell the male and female apart by their chest feathers. The female has darker chest feathers in the shape of a necklace. And how about this guy! 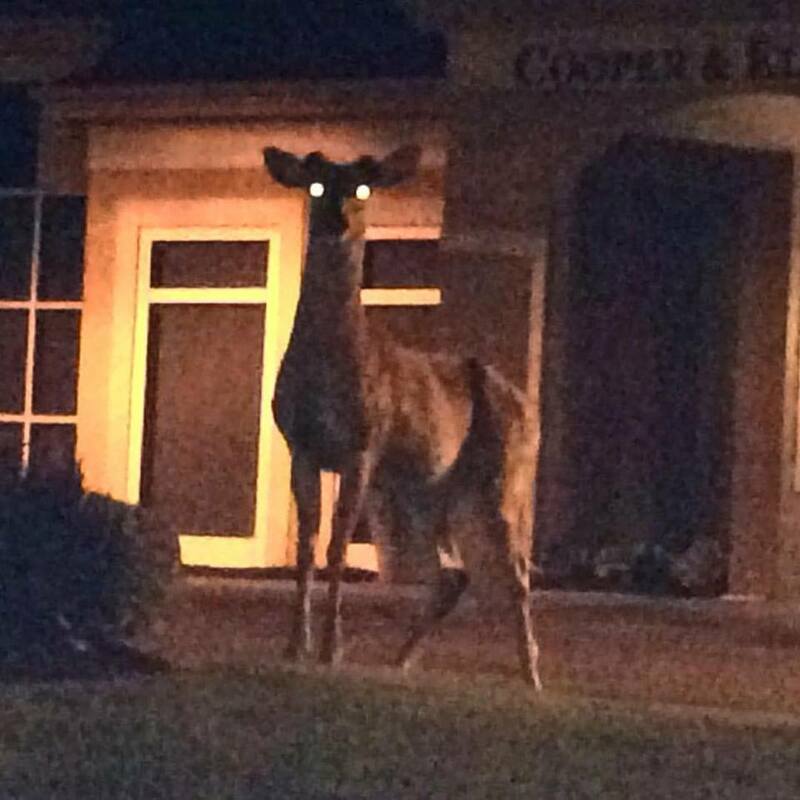 I saw this HUGE buck on my way into work. I thought it was fake at first, but I was stopped at a traffic light just after 2AM and snapped a photo. Keep the rain gear handy for today and tomorrow. We will start your Wednesday dry, but scattered showers and storms arriving around midday with highs in the mid 60s. Scattered showers will stick around tonight and Thursday and staying cool. 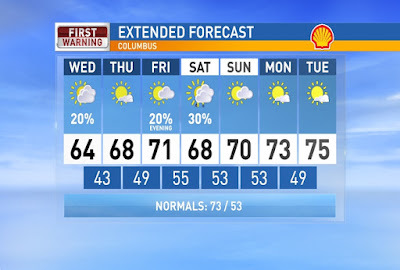 We start a warming trend with dry weather Friday then 70s for highs return for the weekend. Scattered storms likely later Saturday then drying out by Sunday. Have a good one! 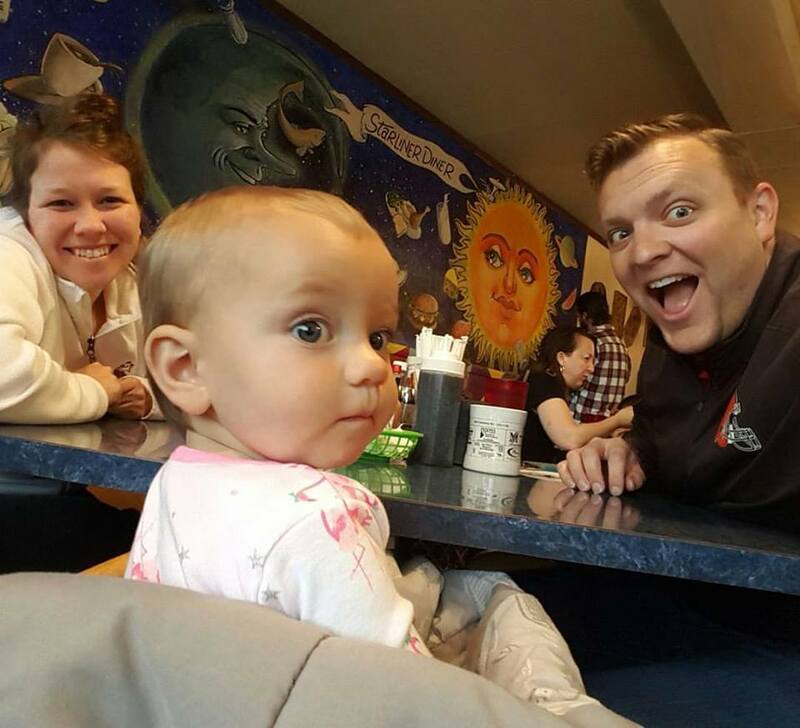 This was our first time at Starliner Diner. We went Saturday morning and it was GREAT! I don't know how we have never been there! We spent the rest of the day running a couple of errands then relaxing. Sunday Dawn and Summer went back to Cleveland for a bridal shower, so I went for a motorcycle ride up to Powell for the Street Market. 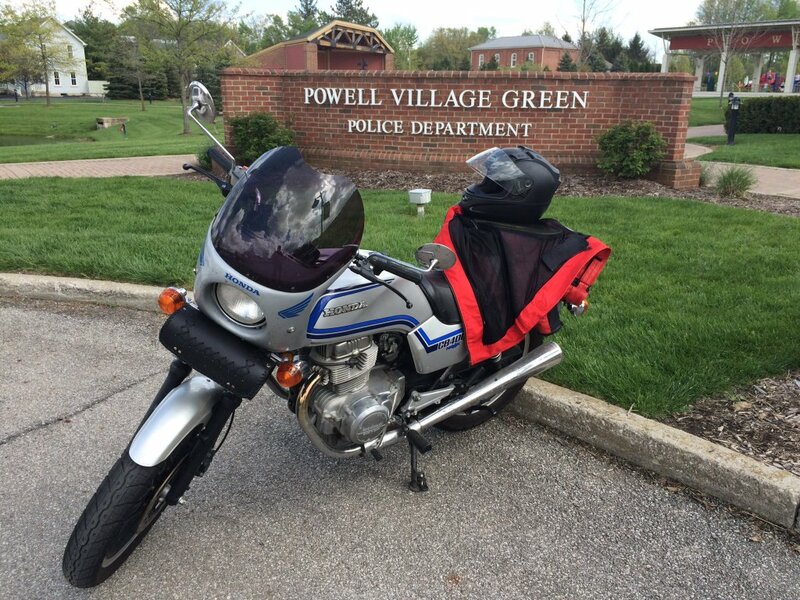 Found a nice spot in front of the police station. But then I noticed a storm a few miles north, so I figured... when in Rome. I stayed south of the storm itself, but above you can see the rotation higher up in the storm with green and red showing the different wind directions. There was VERY little lightning, but I had a GREAT vantage-point to watch the storm. 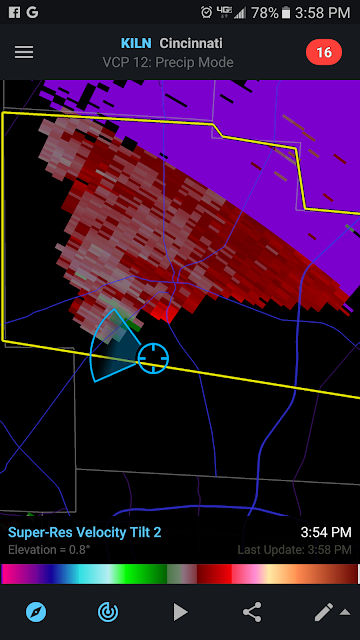 You can see the wall cloud, but no visible rotation that low. There was a brief 30 seconds of rain that wrapped around. 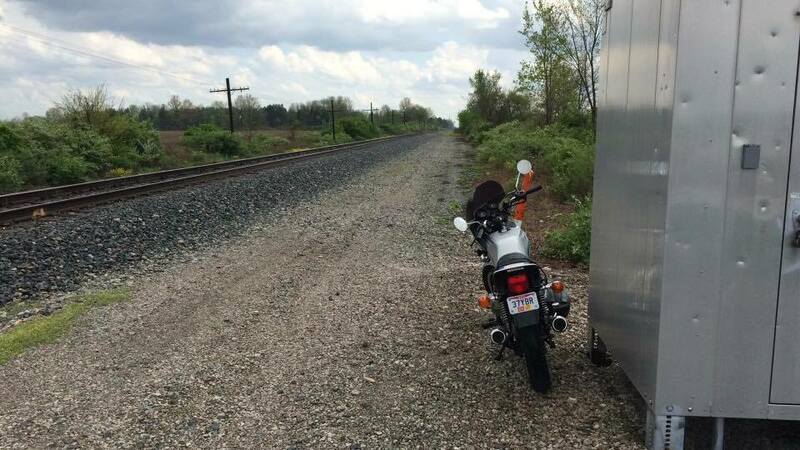 So I moved the bike. I only had to go a tenth of a mile down the road and back on dry pavement. I also made a huge skillet of omelets yesterday, so that means I have breakfast made for a few days this week. Gotta get that morning protein. 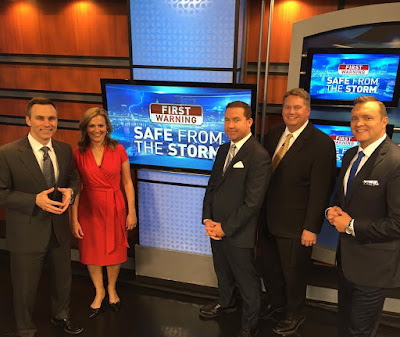 Storms are moving out for the start of the workweek. Just a slight chance for an isolated rain shower for the afternoon today and a spotty shower possible overnight into Tuesday. Most of Central Ohio will be staying dry. Temperatures will be mild with highs in the 60s. The best chance of rain this week will be the second half of Wednesday with scattered showers and a few storms. Dry for week's end then warming up for the weekend. Have a good one!